Snobby Tours Travelblog: CRYSTAL BRIDGES MUSEUM OF AMERICAN ART: The Largest Art Museum to open in the USA since 1974. CRYSTAL BRIDGES MUSEUM OF AMERICAN ART: The Largest Art Museum to open in the USA since 1974. Crystal Bridges Museum of American Art, located in Bentonville, Arkansas, is the largest art museum to open in the USA in over three decades!! It takes its name from Crystal Spring—a natural spring on the Museum's wooded site that feeds into the Museum ponds—and from the unique bridge construction incorporated into the building design. Opened in late 2011, Crystal Bridges Museum of American Art was founded and endowed thru the generosity of Alice Walton, daughter of Walmart founder, Sam Walton. The Crystal Bridges art collection offers a superb overview of American art, including American masterworks as well as surprising lesser-known gems from the Colonial era to contemporary work. Sculpture in the collection graces interior galleries and outdoor trails. The building was designed by renowned architect Moshe Safdie. Safdie is an architect, urban planner, educator, theorist, and author who embraces a comprehensive and humane design philosophy. Safdie is committed to architecture that responds to human needs and aspirations and is informed by the geographic, social, and cultural elements that define a place. 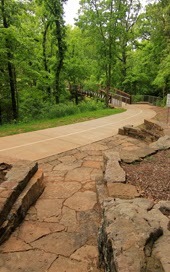 The trails and grounds of Crystal Bridges are a must-see part of the Museum experience. More than 3.5 miles of trails wind through the Museum's 120-acre site, providing guests with access to the beautiful Ozark landscape. Highlights include the historic Crystal Spring, for which the Museum is named, and several outdoor sculptures along the Art Trail. Designed to spark the imagination, the trails help guests form connections to the land and its history, as well as learn about art and Arkansas plant life. Crystal Bridges' permanent collection spans five centuries of American masterworks ranging from the Colonial era to the current day. Included within the collection are iconic images such as Asher B. Durand's Kindred Spirits, Rosie the Riveter by Norman Rockwell, and Andy Warhol's Dolly Parton, each reflecting a distinct moment in American artistic evolution. In addition to historical works, the Museum's collection also showcases major works by modern and contemporary American artists, including Roy Lichtenstein, James Turrell, and Georgia O'Keeffe, providing visitors with a unique opportunity to experience the full scope of American art. Crystal Bridges will continue to grow its collection through the efforts of its professional staff as well as through important gifts from private collectors. The permanent collection, which is on view year-round, is further enhanced by an array of ongoing temporary exhibitions. Oil on canvas, 44 1/2" x 34 1/3"
One recent temporary exhibit at Crystal Bridges was "American Chronicles: The Art of Norman Rockwell", which was organized by the Norman Rockwell Museum, Stockbridge, Massachusetts. This exhibition had been made possible with the generous support from National Endowment for the Arts, American Masterpieces Program; the Henry Luce Foundation; Curtis Publishing Company; Norman Rockwell Family Agency; and the Stockman Family Foundation. It was also sponsored at Crystal Bridges by the Bob Bogle Family, Cadillac of Bentonville, the Paul and June Carter Family, ConAgra Foods, Hallmark Cards, Inc. The Museum's restaurant, Eleven, offers modern American comfort food in a setting as vibrant and exciting as its menu. Enjoy familiar favorites from the South and Midwest, prepared with an innovative twist. Eleven is open for lunch service daily, and dinner on Wednesdays and Fridays. Picnic lunches are available seasonally to take out onto the Museum grounds. The Museum Store—designed by Marlon Blackwell—is located across the courtyard from the Museum's main lobby. The Store offers educational and art-centric toys and games, a wide selection of books, gifts, jewelry, apparel inspired by the Museum's permanent collection, and prints of many of the most popular works. Original works by the finest artists and artisans in the region are also available for purchase, along with classic home décor and glassware by notable American designers. The Crystal Bridges Library offers a large collection of art reference materials that are available to scholars, students, educators, and community members who wish to learn more about American art and cultural heritage. An emphasis is given to resources that reflect the Museum's permanent collection. The Library will be open to the public during all Museum public hours, and will feature changing exhibitions of books and other materials related to current Museum exhibitions. © 2013-2014 Snobby Tours®, Inc. All Rights Reserved.